Happy Friday! What do you have planned this weekend? After a wet and dreary week, we're finally going to have some sunny, warm weather the next couple of days and we can't wait! We're going to a crawfish boil tomorrow; have you ever been to one? Tons of food, people, and games. Should be fun! This week's FF is a very, very special one. Matthew and Paul are such an inspirational couple and their story is so beutiful. Paul is an amazing painter and he makes the most gorgeous art. The only thing is that he is almost completely blind, with his central vision being just about "the size of a keyhole." He has Retinitis Pigmentosa, a progressive disease, that will eventually cause him to lose all sight. According to his Instagram, all of his art sales contribute to finding a cure for RP. You can check out his art on his Etsy shop here. Matthew is a violinist who plays the most BEAUTIFUL music you've ever heard. Seriously, check out his rendition of Never Enough from The Greatest Showman. Speechless! Where are you from? 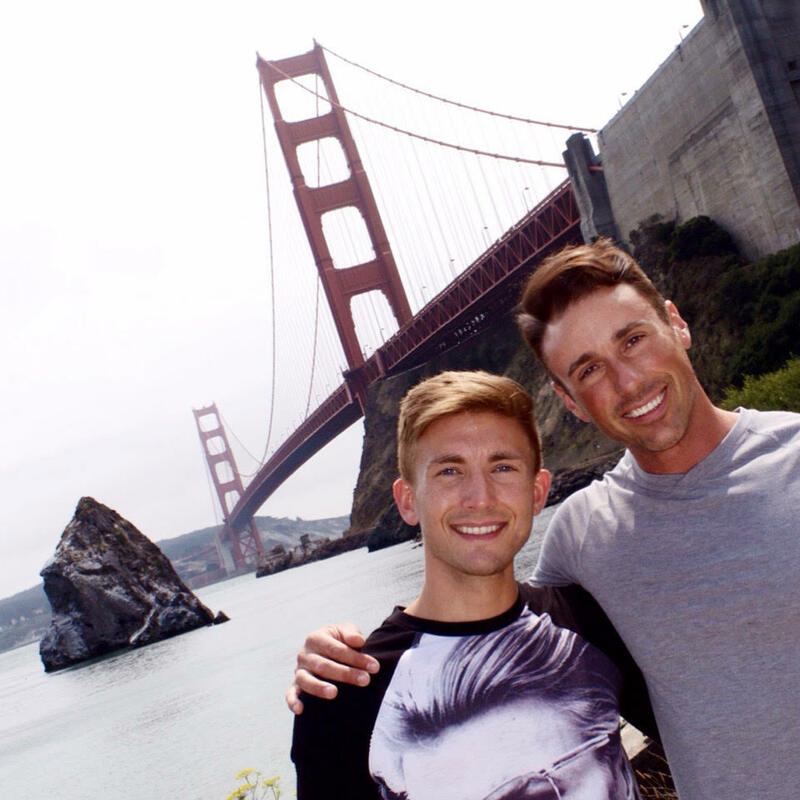 Matthew was born in Sante Fe, New Mexico and Paul is from Vancouver, Canada. Where do you live? We live in Seattle, Washington. 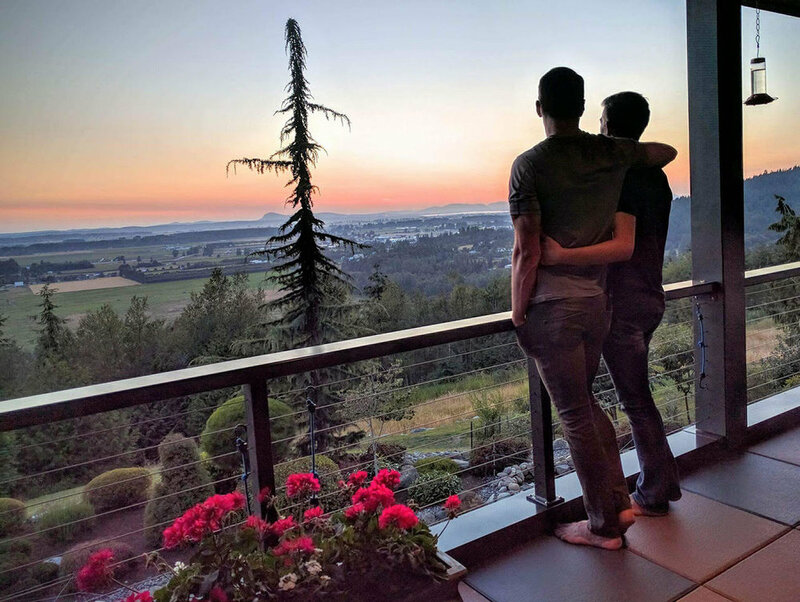 Matthew moved to the Pacific Northwest 10 years ago, but Paul has always called the PNW his home. We get a lot of rain. but they don’t call it the Evergreen State for nothing! Relationship status: We’ve been practically inseparable for 2 years. What is your favorite place you have travelled to and why? We recently visited Hawaii for the very first time, and we absolutely fell in love with the Big Island. I’ll never forget the moment we both dipped into the warm ocean waters off Mauna Kea. We looked at each other with the biggest smiles on our faces… it was the first time we had ever set our feet on tropical sand, and we were in heaven. It’s a bit of a cliche, but the sunsets really ARE better there!! How did you guys meet? Who asked out who? I found Paul’s IG page and was immediately attracted to him. Not just because he’s cute (he is!) but because of the stuff he was doing. Paul is a legally blind visual artist, he runs marathons, and he loves eating healthy and staying active. I struck up a conversation with him and it took me a couple months to arrange our first IRL date - and he was worth the wait. We had the best first date I’ve ever had. We stayed up talking until 5 am! How did you know each other were “the one”? We both knew pretty quickly. Paul later confessed to me that he wrote about our date in his journal the next day… he wrote: “I think I just met the one.” And I have to admit, I felt the same way. I was a little scared because I wasn’t prepared to have those feelings so quickly. But when you find it, you can’t run or hide. You’ve got to embrace it and enjoy every “first” together. That’s what we did. Any big plans for the future? Where do you see yourselves in 10 years? Paul and I started a business together shortly after meeting. We are both creative people and we produce music videos as a team. I’m a classically trained violinist, and Paul is a talented filmmaker and editor - so we invented the YouTube channel “Shirtless Violinist” and we’ve been having the time of our lives making videos, music, and other digital content. I honestly don’t know if I’ll still be playing half-naked music in 10 years, but we’ll definitely be doing something creative with our lives. Paul is my best friend, my partner, and my creative collaborator and we both feel extremely lucky. How would you describe your home decor style? Because Paul is losing his vision, it’s important that our living space is bright, open, and decorated with a lot of white. But we both love a pop of color, so you’ll find items in bright red and caribbean blue scattered throughout our home. Live plants are a must in every room! Paul is a painter, so his art is all over our walls. Very colorful, surreal and whimsical imagery describes his style. Lastly, we both have a sense of humor and we love incorporating that in our home decor. As an example, we have a bright orange unicorn head mounted over our fireplace! What is the last show you binged watched? We recently blazed through all 6 seasons of Downton Abbey and we cried when it was over. It’s just THAT good. The costumes, set design, and music are outstanding, and the characters stay with you for a long time. We also loved the new Queer Eye! How do you guys handle arguments? As I said before, we not only live together but work together, too! So, yes, arguing is a healthy part of our relationship. It’s not about whether you argue, but HOW you argue. We listen to each other, let each other speak, and (as hard as it may be in the midst of a heated debate) show empathy and understanding. Our number one rule is “never ignore or shut down” and our second rule is “never go to bed angry.” We have stayed up until 2 am on more than one occasion to make this happen, but we stick to our rules. How old were you when you came out and what was your experience like? I came out in my early twenties and it was a difficult experience. Growing up in a very conservative and religious environment meant that not everyone was able to accept it. As challenging as it was, making that decision was one of the most important turning points of my life - and I am so grateful to be where I am today. Paul came out after high school. He bought a ticket to San Francisco and moved down there, came out, and marched in his first Pride parade all in the same week. 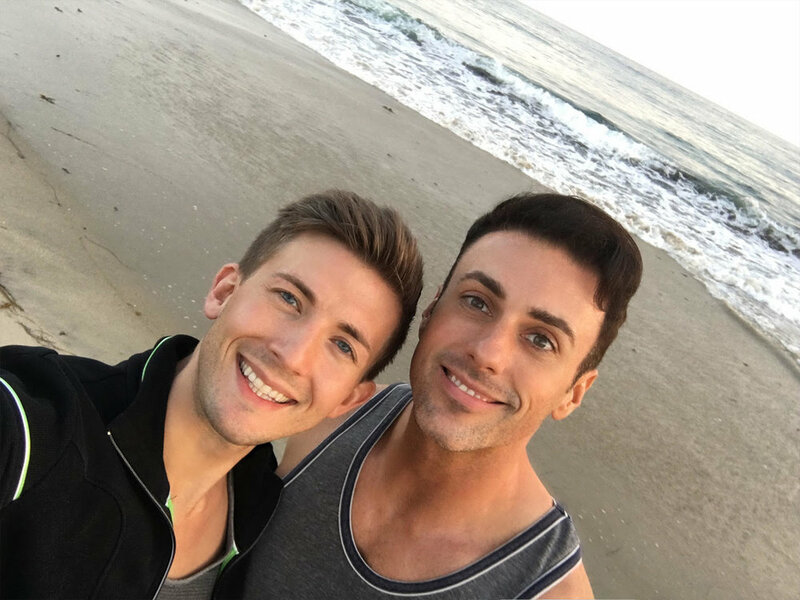 Have you faced any backlash as a couple since coming out? If so, how do you deal with that? As part of our YouTube channel, Paul and I recreate Disney Fairytales with a gay spin. We’ve done Beauty and the Beast, The Littler Mermaid, and more. Thankfully there has been a lot of love and support for what we do, but it’s not hard to imagine that we get negative comments as well. We have to censor the occasional homophobic remark because we want our channel to be a safe space for people to enjoy - but it’s a reminder that there are still many people in the world who do not accept homosexuality. What is your favorite thing about one another? We both share a lot of respect and admiration for each other’s art. Paul is my biggest fan when I’m playing the violin, and I adore Paul’s paintings. His creative mind is such a turn-on. We spend a couple hours every day working on our “art” in the same room. I practice my violin while Paul paints just a few feet away from me. We love this time together.